FOX has reportedly cancelled their mid-season replacement comedy Us & Them. According to Deadline, the network has shut down production on the romantic comedy and isn’t going to produce any new episodes. For now, the network says that they plan to air the seven installments (six plus the pilot) that have been filmed but the show is done. The cast has been told they can take other roles. Apparently the network felt that the tone of the romantic comedy was too soft to fit in with the rest of their comedies. FOX also feels they already have enough other mid-season sitcoms with shows like Surviving Jack and Enlisted waiting in the wings. Us & Them has been described as a single-camera ensemble comedy that follows a pair of young lovers (Jason Ritter and Alexis Bledel) whose relationship is complicated by their each having an unusual group of friends. The rest of the cast includes Ashlie Atkinson, Dustin Ybarra, Jane Kaczmarek, Kerri Kenney-Silver, and Kurt Fuller. What do you think? Are you sorry that Us & Them has been shut down? Will you watch the episodes if FOX airs them? 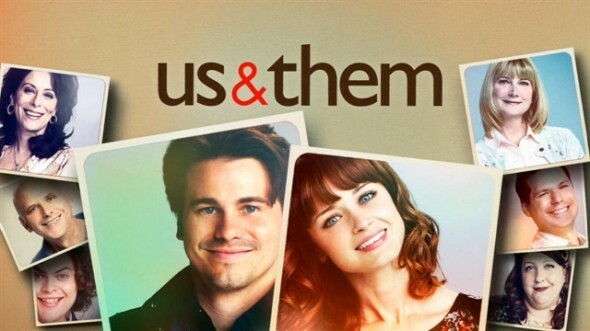 More about: Us & Them, Us & Them: canceled or renewed? Good show…well written. Yoo soft??? Seriously!!! Fox should never cancel quality shows. Besides being a remake. To say the show was “too soft”, is why FOX is failing. They don’t know WHAT they want to be. The only compliment I can give them is that they are open to various genres, but they treat their shows like crud when it doesn’t get above a 7 mill on the outdated nielsen ratings board. I was so looking forward to seeing this show. It makes me incredibly sad that it was canceled before it even begun. Bledel and Ritter, love it. My mum was also looking forward to it. I had been waiting since i first heard about this show in 2013. Sad that its only gonna have seven episodes aired, though seven is better than nothing. I`m sure if this show wasnt canceled it would have lasted along time. This is the worst casting ever… especially for Smithy and Nessa, who actually make the show. If you have seen the original, it makes you glad they cancelled. Original is “Gavin and Stacey” filmed in the UK. Watch it on Amazon Video or Netflix and you’ll see how much better it is. Wow! Cancelled before it even aired! Now that must be a record! Sadly, no. There are several.